As a teacher working in Pakistan, my advice to the government would be to encourage more female teachers to enter this profession at the primary level. Female teachers tend to be more nurturing and they have a softer, more maternal approach, which builds confidence in young children. Male teachers tend to be very harsh and this shatters the child’s confidence and their interest in education is just not developed properly at the primary level. I think under female teachers, the children’s foundation becomes stronger and they tend to enjoy schooling more – they feel more comfortable, they feel like at home. The government of Pakistan has recognised this and is hiring more female teachers – so change is coming soon and hopefully more children will stay in school past the primary level. 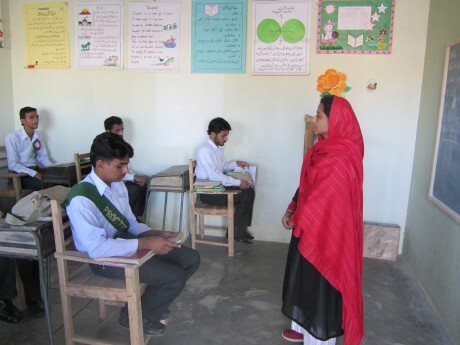 The Fazilia Trust’s policy is to also encourage co-education at least at the primary level. We are trying to make people more aware of the benefits of co-education so that their thinking changes. Co-education is more natural for children and it encourages healthy competition. I think people are generally becoming more accepting of the concept and at least in the Punjab, discrimination against girls is finishing off. However, there are still some families that are struggling against it, especially the Pathan families who are very conservative. We have discovered that the real problem is that of affordability – more families will send their children, both boys and girls, to school if they can afford it. More children started joining our school when we started giving concessions on the fees. Most families want their children to have a quality education – and thanks to the media, people are very aware now of the benefits of education. They also meet other families who have sent their children to good schools and they can see the change it has brought. Even if one child receives a good education, it improves standards in the whole family. People here believe that their future wellbeing is tied to their children. And an educated child’s future is very different from that of an uneducated child’s. An educated child can change a family’s destiny. At our school we have noticed that when children from hard areas come here, within a year or so, their parents send their siblings as well. The change in the child is so positive and noticeable. Through word of mouth, other families have become inspired and they have also started sending their children here. Within the last two years, our admissions have gone up by 130 students – we now have 386 students. I think in the coming five to six years the primary level rate will improve overall in the country. The government’s policy is improving – they are providing free uniforms and free books in addition to free schooling at the primary level and where there are gaps, the private sector is stepping in. Private schools, like ours, offer reduced monthly charges to underprivileged children and give relief to their families. This is a very positive change. I am hopeful that our literacy rate will improve in the coming years. Just take our school as an example – we are getting more admissions by the day. We had to turn away a child two days ago because we could not take him until the new term starts. Our nursery section has grown to 60 students this year, so we have had to make two sections of 30 children each. We are building new classrooms that are almost ready and plan to shift the entire primary section to the newly constructed buildings.